Believe it or not, this year, Greenlight actually turns five. That’s right, Valve’s attempt at creating a better curation system for game additions to the store section of Steam has been around for close to five years now. Won’t be around for a sixth, though, as its replacement was announced just the other day. “Finally”, some might say, and honestly, I’m inclined to agree, for so many reasons. That said… based on what is known at this point, it kinda looks more like Greenlight 1.5, rather than 2.0; a patch, rather than a solution, ya know? I mean, its launch is still several months away and we don’t really have an abundance of details yet, nor is anything set in stone. And seeing how one particular issue has caused quite a stir among not only Steam users but also desktop (Windows, OS X, Linux) gamers, that’s a good thing. I am of course referring to the publishing fee debacle: “as low as $100 to as high as $5,000”. No. Just… no. Here’s the thing, again, though: it’s a work-in-progress, which means any and all things, at this point, are likely to change between now and its planned launch, in “Spring 2017” (likely around April / June, I’d wager…). That and the aforementioned post does state that they’d “like to gather more feedback before settling on a number”; and yet people are up in arms, crying bloody murder about how $5,000 is way too high, is too strong a ‘filter’, and so on. Not that I disagree, as without some sort of filtering, we’d have a repeat of what Greenlight was initially – overflowing with joke submissions and things not even remotely related to video games. Never again, please. Thankfully, Valve sorta remedied this with a $100 submission fee, which, ironically, is also the low they’re spitballing for Steam Direct. Now, the reason I say ‘sorta’, is… in reality, it was only a partial fix. If you only browse Greenlight every now and then or perhaps catch the odd submission on social media, chances are you’ll never encounter the rubbish. But, having checked virtually every single submission on a weekly basis for The Greenlight Groove since 2013, I can safely say that there are a lot of ‘aspiring’ developers out there with too much money. A ridiculous amount of ‘no one in their right mind would play this, ever’ projects are still submitted every single week, which means… a submission fee isn’t enough. Or maybe it simply isn’t high enough? Thing is though, when you submit your game to Steam – whether it be Greenlight, as it the current, or Direct, the upcoming – there’s no guarantee of it actually getting through the system and onto the store. Ever. None. Oh, and the joke submissions certainly don’t help, as these make for rather disheartening queues to wade through, ensuring a lot will never get much attention from Steam users. Heck, the ‘pointless meme game‘ flood, for example, has made even me want to give up on the platform/system at times – it’s just… ugh. Now, whether Steam Direct will actually remedy this or not, well, no one knows. But seeing how Valve more or less created Greenlight, then left it alone – save for the paperwork required once a submission has garnered enough attention and/or votes – I’m more than a little skeptical. Hopefully, I will be proven wrong eventually, at which point I will gladly admit to just that. We want to make sure Steam is a welcoming environment for all developers who are serious about treating customers fairly and making quality gaming experiences. One thing that just might make this a noticeable improvement over Greenlight, is the amount of preparation required prior to submitting through Direct: “a set of digital paperwork, personal or company verification, and tax documents similar to the process of applying for a bank account”, and then finally, the fee. The fee which, as has already been mentioned, has not yet been decided upon. Could be $100, could be $1000, could be $666 for all we know. This should, in theory, as Valve puts it, “decrease the noise in the submission pipeline”. In theory. But let’s play devil’s advocate: what if it doesn’t? What then? 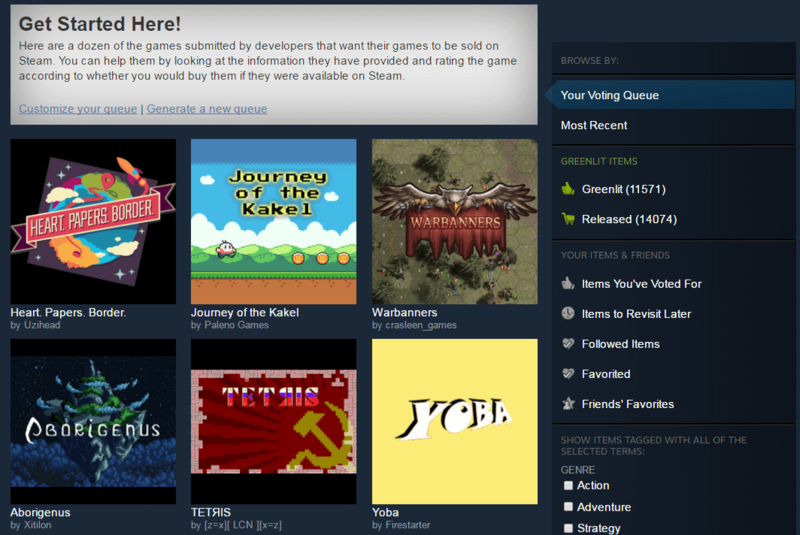 What else can be done to help ease curation of a digital store as big as Steam, really? Greenlight was created to ease the work of Valve employees, and it most certainly did, although unfortunately, it was by no means perfect, joke submissions aplenty (for starters). Time will tell if Steam Direct will bring about Greenlight 2.0, and not something closer to Greenlight 1.5 (a patch, rather than a fix, for its precursor). Not a lot of time, though, as it’s scheduled for launch in just a couple of months. Fingers crossed!